The arrival of December marks the festive wedding season that has us all in a mood for dance numbers and shimmering dresses. Who all can admit that these dresses make us look no less than the most glamorous of celebrities? We sure can! The best and most fun function is the Mehndi. Its jubilant colours and a shower of lights mean we need something special to wear. Today, we at SiddySays bring you our top picks of Mehndi dresses that will surely steal all hearts away! 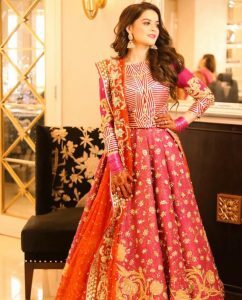 This bright-coloured number from Erum Khan Couture, is seen here donned by the very pretty Minaal Khan for her sister’s wedding. In shades of bright pink with burnt orange, and accentuated with gold – this is a winner Mehndi dress.